Beautiful, functional, and durable, our plantation shutters are handmade by expert craftsmen using only the highest quality materials available. They are then painted or stained in our factory in Hampton, Virginia, before being permanently installed in your home or office by our professional installation team. 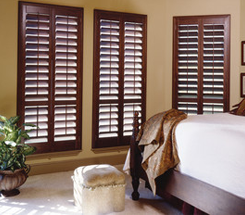 Made from solid, American wood, our shutters are guaranteed to last longer than other window treatments. For more than 26 years, Chesapeake Bay Shutters has offered locally built planation shutters to customers in the Virginia Beach, Virginia, area. Energy efficient and easy to clean, our solid, wood shutters are an elegant way to make a statement in your home or office, complementing both classic and contemporary decor while simultaneously increasing the value of your property. Check out our gallery to see some of the shutters we've installed as well as read a few articles about our business. Monday - Friday, 9 a.m.-4 p.m.
Virginia Beach, Williamsburg, Hampton, Newport News, Norfolk and surrounding areas.